His first foals arrived in 2009 and has already produced a Yearling In Hand Trail Champion and World Show Finalist. 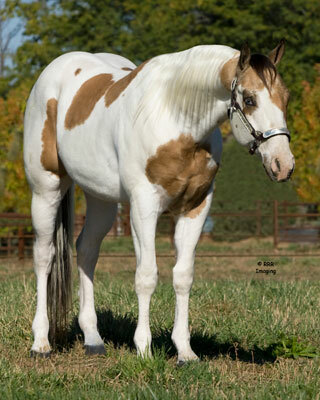 This young stallion is Dun and Homozygous for the Tobiano gene. He also has one copy of the Cream gene, which means he can produce Palomino, Buckskin or Smoky Black. He has been started under saddle and is showing all around potential, he is very athletic and great minded. His sire Roddin Real is a Superior Western Pleasure horse and has Trail points. His Dam Docs Sugar Plum produced Metallic Zippo who was the #3 Master Amateur horse in the nation for 2009 and has accumulated over 2300 APHA points. He also was the 2007 Pinto World Amateur All Around Horse. His Grandsire Docs Mr Whiskers has a Superior in Western Pleasure & Trail; he is a 2 time National Champion & has 423 APHA Performance points.